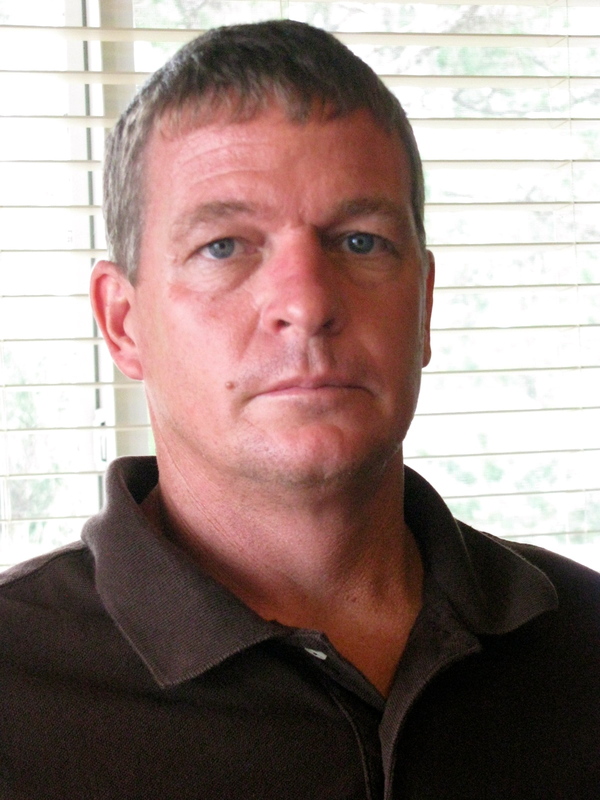 Several years after graduating from Venice High School in 1988 Marc Good joined the Army. He beame a medic in Bravo Company, Third Army Ranger Battalion, 75th Ranger Regiment. In 1993 B-Company, Third Battalion went to Somalia in the Horn of Africa as part of a United Nations contingent to enforce international law. Their job: Kill or capture self-proclaimed President Mohamed Farrah Aidid, a Somalian war lord, making life unbearable for the inhabitants of the war-torn country. It began on Oct. 3, 1993 as a quick search and capture mission into Mogadishu, the capital city, to grab two of Aidid’s lieutenants by the Third Rangers in support of 1st Special Forces Operation Detachment Delta. It became a disaster for the Americans when insurgents shot down two of their Black Hawk helicopters. Over the years, since the Somalia battle, Good has said little for publication concerning the incident. Here he tells his story about the part he played in the nasty little African fight. “I was assigned to the Third Ranger Battalion. When I arrived I found they were short of medics. I took a crash course at Fort Benning, Ga. in civilian EMT school to learn to be a medic. “After graduation they made me ‘acting medic’ of our Ranger platoon. This was in 1992, after ‘Desert Storm’ when Somalia and Mogadishu started coming across the TV news. “Shortly after a couple of quick deployments to Korea and Thailand to work along side Rangers from those countries, Bravo Company was sent to Texas to take part in a big joint operation training maneuver. Then our company was put on alert and sent to Fort Bragg, N.C. to a secret compound used by Delta Force. “Because an American convoy had been ambushed and slaughtered by Somali insurgents our company was sent to take out the war lord. 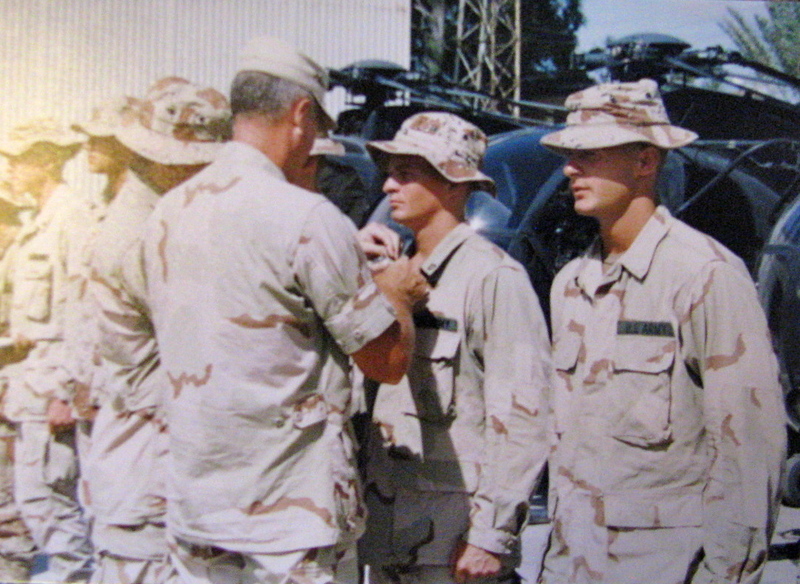 The 150 Rangers in Bravo Company flew into the airport a Mogadishu in C-5 transport planes sometime in September 1993. “By the time I got over there I was a 23-year-old private who had served seven months in the Rangers. I carried my own pack and a second pack full of medical supplies together with my CAR-15 carbine into battle. “They put us up in bunks in an airport hanger. We went on seven or eight missions while there. When we got a call to fly, we’d get all our gear on and climb aboard the helicopters. We’d fly to the part of Mogadishu where the action was taking place and fast rope down from Black Hawks. “Everybody suited up, got aboard the aircraft and right before we flew out our ‘Chalk’ leader jumped into the Black Hawk with a napkin-size drawing showing where ‘Chalk-Four’ was going to attack. “Four Black Hawks carrying four ‘Chalk’ teams were to fly into to an area of the city with seven story buildings. The Rangers were to cordon off a block of these buildings while Delta Force went in to capture two of Mohamed Aidid’s lieutenants. “As our helicopter moved into position something happened. We were a block away in the wrong intersection when someone on board dropped one of the fast ropes over the side. “You can’t imagine the adrenaline going through us at this moment. The first guy grabbed the fast rope and started down immediately. Once he went down we all followed him in. “As we were going in we could hear gun fire. This was the first time in any mission we’d been on where we heard gun fire this quickly. “I was the last guy on my side to leave the aircraft. 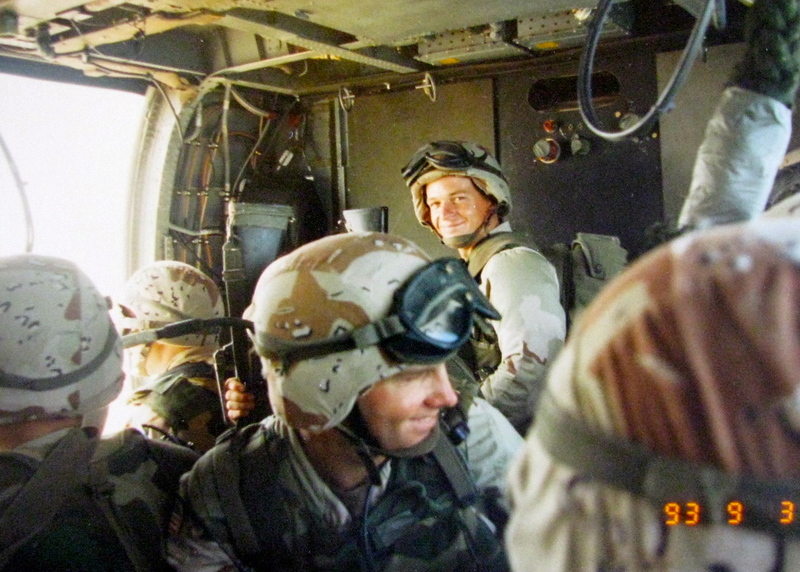 The guy that went down before me was my team mate and buddy on the ground, Todd Blackburn. He grew up around Bradenton, (Fla.) a few miles north of where I grew up in Venice. “I watched Todd put his hands on the rope and disappear into a cloud of dust kicked up by the blades of the helicopter. I grabbed the rope and slid down. I was in a sandstorm, but I knew which direction I was to run to get to cover off the street. “I took five or six steps and almost fell over a body in the middle of the road. I looked down at him. His helmet was off and he was bleeding out his ears, mouth and nose. One of his eyes was open and the other one was shut. “I got down on my hands and knees and looked at him more closely. I realized he must have fallen coming down the helicopter rope because he had severe head injuries. He was unconscious. “All the while I was checking the soldier’s condition the insurgents were shooting at us who were still in the street from the roof tops of surrounding buildings. It was about this time I realized the downed guy was Todd, my Ranger buddy. Todd was the guy who was always telling me he’d take care of me if we got pinned down by the enemy, because he had more experience than I did. “About this time I realized he wasn’t breathing. I began checking him out so see if I could get him breathing again. I opened his mouth and it was filled with chewing tobacco. I took my finger stuck it in his mouth and pulled out the wad of tobacco. As soon as I did that, he spit out some blood and started breathing again. “We just grabbed him and dragged him off the street. “I was working on bandaging him up when a Delta medic showed up beside me. He was a senior medic with 10 years experience. He helped me get a splint on Todd’s broken arm. Since he wasn’t bleeding profusely we put him on a stretcher and I got some volunteers to help me move him. “The Delta medic told me there wasn’t much more we could do for Todd. He added, ‘What we need to do is get him airlifted out of here.’ Then he returned to his own Delta team. “All the while the guys in my ‘Chalk’ group were shielding me from the attackers. They had their backs to me firing at the insurgents who were coming to the street corner, sticking their rifles around the corner and pulling the trigger. “By this time our leader had called in for help. They sent out an armored patrol of Humvees to rescue us. He told them we had a severely wounded guy we were going to have to move by stretcher and find another place to take cover. “We must have had six guys on Todd’s stretcher carrying him down the street. People kept coming over the roof tops shooting down on us. We’d have to drop him, I felt kinda bad about that, but Todd was unconscious.We’d grabbed our weapons and started shooting back at them. “Right about then one of our Black Hawk helicopters providing us with close air support, flared out over the street where we were. The pilot opened up with his mini-guns on the guys on the roof. He took them apart. FOR heroism on 3 and 4 October 1993, while serving as a Chalk Medic for Company B, 3d Battalion, 75th Ranger Regiment during operations in Mogadishu, Somalia. On the fast rope insertion, a fellow ranger suffered a C-spine injury. Private First Class Good stabilized, immobilized and extracted his fallen comrade under fire. Though the extraction vehicle was engaged all the way to the rear, he kept his Ranger buddy alive. Private First Class Good’s dedication to duty and total disregard for personal safety reflects great credit on him and the United States Army. This story was first published in the Charlotte Sun newspaper, Port Charlotte, Fla. on Monday, Oct. 29, 2012 and is republished with permission. Click here to view Good’s collection in the Library of Congress. Thank you Don for this legacy which is priceless. I wish every American could read and realize what our men and women in uniform have lived through while on duty. I wish the Commander in Chief and all of those below in rank could read all of what you have so faithfully documented about so many wars and the scars they left on those who served.